Within the scope of the Athens Festival, an exhibition of modern large-scale sculpture is organised for the first time, up to the standards of a biennale. Works by significant artists, such as Dali, Matisse and Picasso, are exhibited at the outdoor space of the Hill of the Muses (Philopappos). Eleftheria newspaper, 21/12/1961; GNTO (Greek National Tourism Organisation) 1965; Adamopoulou 2004, 249–250. A photograph of Auguste Renoir’s “Venus Victrix”. 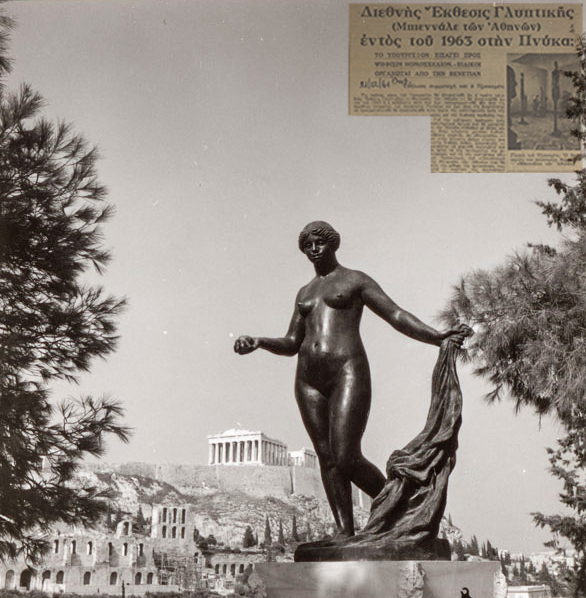 The piece of sculpture was among the exhibits at the International Exhibition of Sculpture (Athens Biennale) that took place in 1965 on the Hill of the Muses (Philopappos). Article from the newspaper Eleftheria (top right), making mention of the special event of the International Exhibition and of the internationally acclaimed artists that would participate.